Independent Home Products, LLC custom manufactures handicap accessible bathtubs & handicap accessible showers to match each customer's specific needs. We offer many models and styles to choose from as well as honest and fair pricing on each and every one of them. A wide variety of accessories will allow you to customize your handicap accessible bathtub or shower to best meet your needs. No other handicap bathtub & handicap shower company offers the extensive features that Independent Home Products, LLC can. Simply call (262) 226-2036 for a free consultation and quote on installing a handicap accessible tub or shower in your home. A Independent Home Products, LLC handicap accessible bathtub or handicap accessible shower will allow you the independence to bathe and shower in comfort and safety within your home. Our handicap tubs and showers are specifically designed to transform a tub or shower into a beautiful and safe handicap space. 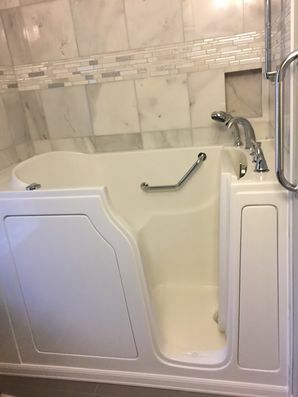 As the leader in designing and installing handicap accessible bathtubs and showers since 2007, call Independent Home Products, LLC today at (262) 226-2036 to ensure your loved ones are safe and comfortable within their bath environment.